Sickness can be spiritual, physical, emotional, and mental. There are instances of healing that happen immediately at the very first moment of prayer, anointing and there are instances of healing that happen only after long period of waiting and many experiences of prayer. There is God-ward side and man-ward side to every battle and blessings, so while waiting on Jehovah Rapha, the God our healer for full manifestation of healing. Thanksgiving is a vital key to experiencing the miraculous, we must not reserve for when miracle comes to full fruition. It is in the Holy atmosphere of praise and worship that healing and miracle begin to manifest. The sacrifice of Joy is the most difficult to offer when afflicted or troubled within and out. Yet Nehemiah 8:10 says the Joy of the Lord is our strength. Strength is emotional toughness and resistance, it is defensive ability. Dancing, singing melodies, reciting psalms, smiling, laughing rejoicing in what the Lord says about us. we need to overcome the realms of our 5 senses and human reasoning. Our words have power to create or destroy. Mark 10vs 50 reveals the blind Bartimaeus threw aside his garment and rose and came to Jesus. The garment to this blind man was his valuable asset, being his status identification, his means of collecting alms, may be his source of shelter and warmth. To us it can be no longer rely on whatever we had as any other hope of survival. Casting away all doubt, no thinking otherwise. Casting away all fear and connection of discouragement. Possess the promises of healing in Christ Jesus Ipeter2:24, Isaiah 53:4. To keep confessing the word of God help curse the root cause of the problems and it releases Jesus into the situations. Sometimes, healing seems to be delayed. In Exodus 5:22-23, Moses spoke the word of God(let my people go and serve me) to Pharaoh but he refused. God gave Moses the strength to continue confronting Pharaoh with the word of God till his final destruction. 2Chronicle 7:14 says, if my people who are called by name will humble themselves and pray and seek my face and TURN FROM THEIR WICKED WAYS then I will hear from heaven, forgive their sins and heal their land. There is need to examine life from any area of sin that has not being dealt with, repent, make restitutions if need be. It causes to falter in confidence before God and making request known, it also gives Satan ground to condemn and judge. Delay in manifestation sometimes means to grow us in faith and patience making us spiritually fit. God honours those who honours Him. The principle of this kingdom is the principle of input and output, seed time and harvest time. Everyone gets what they sow. God is telling us this evening that “give me honour and I will honour you back in return”, despise me and I will neglect you. Sow the seed of honour into the kingdom and you shall reap honour. Can you harvest a maize without planting a corn? That’s not possible. How can I honour God in my daily living? Someone might ask how can he/she honours God as a lifestyle? Praise is a sure way to honour God. You’re only qualified to honour God when your breath is in place. In everything, not for every thing, praise the lord. There are some companies of people that would not ask before they receive, these are people in the companies thanks givers. Any time you acknowledge God, He expands you. It’s a matter of perspective, out of paralytic perspective. Many – though born-again Christian – have been bittered with God because they have made themselves prayer projects by placing all kinds of demands on God, switching from one prayer house to the other. It’s not as if i’m against asking but it’s so disgusting the way many Christians have expanded their problems, dishonored themselves all in the name of demands. Praise kills the prayer projects mentality. Praise unleashes divine ideas. You can live a praise lifestyle and be stranded of ideas. When Jesus was here He always knew what yo to do. When they needed to feed 5000 people, He gave thanks. Whenever there were confronted with seemingly impossible situation, He gave thanks, and the miraculous follows. Praise lifestyle enhances fresh oil. There are many believers, even pastors, operating with stale oil. Fresh oil connotes fresh revelation. You can’t make things happen in life without revelation. Praise is one of the spiritual activities that engender the release of fresh oil. Understand this, manifestation is a product of revelation. Obedience is the hallmark of honouring God. Anytime you obey God, you set your foot on a pedestal of enthronement/honour. If Jesus who was given the Holy Spirit beyond measure could not move an ant other than to honour His father then you and I have no choice than to follow the same principle. Our journey to honour in life begins with obedience. Where your obedience stops is where your honour stops. Dedication equals decoration. Every commandment of God is meant for our profiting. God has not commanded in order to grieve us, He has commanded us in order to expand us. God has not commanded us in order to punish us, He has commanded us in order to polish us. The word of God is 75% instructions and 25% doctrines. Honour God by being responsible. You better start carrying responsibility until it’s too late. It’s never too late. You will die as a liability until you start taking responsibility. Repent of all spiritual irresponsibility. Be financially responsible by honouring God with your thite and offerings. Be spiritually responsible by honouring God with Kingdom advancement prayer and soul winning endeavours. 3). Believe – lastly, honour God with you faith. You can’t move God without faith. Honour God with your thoughts. God thinks, and He thinks positively. You are God’s offsprings – God’s sons and daughters. According to the law of the universe, every living thing duplicate itself into its offspring, a cow can’t give birth to a goat, a mango tree can’t produce a cashew fruit. It follows, the son of God is a god. You too should think like a true son and daughter of your father. Speak in line with what you believe. You are what you say. In conclusion, don’t just be thrilled by this teaching, align your life according to its prescriptions, and your place of honour can never be farfetched. Partnership is the gateway to all round settlements. Wrong mentality about partnership will reduce engagement. Understand this: we are not working for God; we are working with God. God does not use people; He blesses people. He is not a taskmaster; He is a paymaster. “And, behold, I come quickly; and my reward is with me, to give every man according as his work shall be. In partnership, every shareholder is entitled to a dividend. So also you can’t partner with God and miss out His dividend. How can I partner with God? Go for His mandates – The 2 mandates of God for every Christian are prayer and soul winning (lk.18:1, Jn.15:16, Jer.1:5). “All men,” not all pastors, ought to pray and not to faint. Prayers are not meant for pastors alone. Prayer is a commandment. “Pray without ceasing.”(1Thes.5:17). Fainting in prayer equals failing in life. Prayer does not only change things; prayer changes people. Whatever you pray for others answers back to you. It is human intercession that provokes the release of divine intervention. Standing in the gap for others (“the lost” and nations) is the surest pathway to a life of fulfillment. Hannah at 84 years old, prayed kingdom advancement prayer (lk.2:37). Daniel prayed kingdom advancement prayer to a point that the king had no choice than to call him Belteshazzar ( a god’s name). Our journey to greatness in life begins with the fear of God. We live in a kingdom of choices and not chances. The ball is in our courts. Daniel made a choice to be different (Dan.1:8) you too choose to be different. It’s common saying that “If you can’t beat them join them” this statement is a satanic statement. You can’t beat them by joining them, or else you will remain under them. Choose to be different. Joseph flee fornication when he knew that his destiny will be tied down. The fear of God is the beginning of wisdom. Wisdom is knowing the right thing to do and doing it. It pays to live right. Its never too late to turn. Live ready it might be too late to get ready. Love God: The hotter your love for Christ the hotter you become in life. Carry a heart for Christ. Those who have the injunctions of God and obey them are the ones who love God. What is love? Love is simply the word that you receive, believe and obey. Passion is the key word here. Love built this blog. Love provokes the release of supernatural manifestations in all spheres of life. Love is making the kingdom of God your number 1 interest in life. Get this straight: If the things of God does not move you, don’t expect the move of God to your direction. God is ever committed to the welfares of those who are committed to His interests. Until you run after the kingdom agenda, supernatural additions is out of view. Your years of toiling is over. Our God is a God of additions. Serving God will not reduce you, serving God will increase you. Our God is a God of multiplication. Things that others are running g after will be running after you when you plug into the frequency of love by hunting after souls both on the prayer alter and by reaching out to the lost through envagelism. The interpretation of this scripture is that some people are praying for the lost to be saved while others are on the field compelling them into the kingdom. Both category of labourers have their rewards. You can do both as many believers are doing today. I decrees – your settlement in every aspect of your life has finally come. God will settle you spiritually, physically, financially, and academically; in your health, career, job, business and marriage in the name of Jesus. No body here will remain unsettled in the name of Jesus. Gal.4:7 says, Wherefore thou art no more a servant, but a son; and if a son, then an heir of God through Christ. So what are the things that can hinder us, disturb us from being a son? God’s purpose for man is for him to live a life of dominion. God wants man to be in charge. God commanded man to live a life of dominion at the beginning, but when man fell, he lost the power to live in dominion. This power to live a life of dominion was restored back to man when Jesus died in man’s place on the cross, buried, and resurrected. The Lord Jesus Christ has paid the price and paved the way for us to dominate. The question now is, why are believers not dominating? Despite the sacrifice of Jesus many of us are still being oppressed, harassed and not occupying our place in destiny. We shall be looking at some of the hindrances to dominion. We will look at some things that are actually hindering us from dominating. Here are some few reasons. This is to refuse to comply with or follow the laid down rules. As citizens of the heavenly kingdom we are to enforce the will of God on earth. (Philippians 3:20). God set the rules, patterns or standards, we are to follow them. If we will not follow His rules by disobeying them, how do we expect Him to give us dominion? It is God who sets up kings and remove kings. Just like you cannot keep disrespecting your boss in the office and expect a promotion, you cannot live against God’s word and be empowered to live in dominion. Deuteronomy 28:1. Obedience is a vital key to living a dominion life. 2 Corinthians10:6. This scripture is saying; fulfill your obedience to God and get uncontestable dominion. Hosea 4:6. Knowledge is very vital if we want to live a life of dominion. When the use of a thing is not known, abuse is inevitable. It is the lack of knowledge that will make a prince walk on foot while the servant is riding on a horse. Knowledge is needed for us to know those things that have been freely given to us in Christ Jesus. If a child does not know he is an heir to a great property, other person will take over it. Violence is crucial in the school of dominion. For us to rule, we must be violent. How do you expect to rule over violent spirits, violent situations, violent adversaries, if you are not violent (Matthew 11:12). Even the Bible said right from the day of John the Baptist, the kingdom of God suffereth violence and the violent shall take it by force. We must be violent in the place of prayer and lawful physical action birthed by faith. As a believer, we are to dominate everywhere; in politics, business, academics, in our offices, on that contract, in our marriages, etc. We have examples of people that dominated even in strange places; like Mordecai, Daniel, Joseph, etc. It is your right as believer in Christ Jesus to dominate. From today receive the grace for spiritual violence and go dominate in Jesus name. Among many others are unbelieve. Judah lost his signet, scepter to immorality, just like many children of God are losing their authority to sin. Genesis 38:7-18, Genesis 49:10. Sin is deadly; it cripples and makes people impotent spiritually. In conclusion, God has pronounced His blessings on His children; these blessings include living in dominion. It is our responsibility to do the needful and begin to enjoy what God had freely given to us. I pray the Lord will help us to dominate in every aspect of our life. As that will be all for today. I pray the Lord will give us deep meaning of His word in Jesus name. This post is duly credited to Sister Folasayo. God answers thoughts like the way He answers prayer. Your thoughts can make you or break you. The woman with the issue of blood only thought(she didn’t pray) and the miraculous flows. Author Chris AdedoyinPosted on March 21, 2019 Categories Faith, LifeTags Bible, God, Light, Mind, Prayer, ThoughtsLeave a comment on God answers thoughts! Partnership is a cooperative relationship between people or group who agree to share responsibility for achieving some specific goals. From this definition, some key words are to be noted. Responsibility which is based on maturity. Before an agreement can be reached between 2 people, there must be trust and love in place and the responsibility part leaves you with doing what you have to do to get you desires result. This means that every one has their roles to play to achieve a goal. God has His role to play as much as we have ours, incomplete fulfilment on our own side places our settlement on a shaky ground. Remember that God can’t do our part and vice versa. Settlement on the other hand is having everything regards our affairs attended to at all times..
Because God is not a user of man but a blessed of those who differently seek him. Once you are in partner with a person, you always put everything in place to make your communication active. How does partnership settles us? Partnership with God places us under His care and guidance (PS 23:3). It makes you a carrier of grace. Remember you are in accordance to Him. It makes you seek His kingdom (Matt 6:33). It makes you serve under Him (Ex 23:25). It is important to know that our love has to be in place before partnership can stand with God. All partnership is based on love. once we love God we are sure to obey Him at all times and if you obey Him,there’s no way He will leave us unattended to at any time. This post is duly credited to: Mayowa Adeyemi. Ezekiel 22:30 And I sought for a man among them, that should make up the hedge, and stand in the gap before me for the land, that I should not destroy it: but I found none. By definition, a partner is a person who takes part in an undertaking with another or other, especially in a business or firm with shared risk and profit. But tonight we’re talking about partnership with our lord business. God original plan for mankind is that after this earth,mankind should have everlasting life with him. But at the garden of eden man lost this opportunity and began to suffer. But in him infinity mercy, after sending a lot of prophets and the word is still corrupt. He sent his only begotten son,so that his original plan can be fulfilled. Jesus worked when He was on earth and when He was going He gave us a commandment to go into and preach about the kingdom of God. Jesus Christ said harvests are many but labourers are few. He needed so many labourers so that we can harvest plenty souls into the kingdom of God. John 14-21, says he who has my commandments and keep them, it is who loves me. And who love me will be loved by my father and I will love and manifest myself to him. God has work to be done on earth and He is looking for who to partner with him to get the work done. If we love Him we will keep His commandments and obey His commandments. Your love for souls of men and you loving what He love prove that you love Him. You may be asking how can I be partner with God. By Evangelize -go into the word and preach the gospel of our lord Jesus. Open your mouth talk to people about Christ. By helping the work of God with your substance: be it your Brain, time, money etc. Dream up some awesome ideas that can propagate the kingdom of God and putting them into action without minding the sweating of your efforts. Another question you may want to ask again is what will I gain in partner with God? John 14-21b say I will manifest myself to him. To who? To those that love him and doing His will. These manifestations of God are the benefits you enjoy for partnering with him. What are the benefit we derive for partnering with him. we become conqueror – trouble will tremble at our presence because God presence is with us because He love us. supernatural favour – when we have pleasure in God business, He will be with us and release divine favour unto us. God is with Joseph and He enjoyed a great flow of favour. Supernatural breakthroughs – anyone who love God is empower to be a pathfinder and a carrier of supernatural breakthrough. Permanent partnership with God make you a star forever and ever (Daniel 12-3)because His presence with you give you confidence and that lead you to breakthrough. In conclusion, God is searching for a man and woman who will work with him on earth so that plenty souls will be harvested into His kingdom. Are you ready to be a partner with God? Determine today and God will bless you. Sorry for taking much of your time. This post is written by Adeola Adedoyin. Other posts written by the author are posted below, you can get access to them via the links. 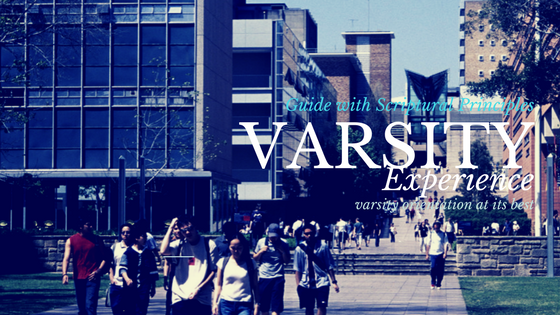 Varsity Experience is a platform which share varsity experience, ideas, life and advice to all varsity students and those who are looking forward to be in the varsity. Our hope is to guide all varsity students with relevant contents so as to see them coming out with flying colours in their academics journey. This platform is where lives are transformed by encountering God's word. God's principle is universal, whether your are brown, yellow, black or white, you need God to help you. Heaven does not help those who help themselves, heaven leave those who help themselves alone. All students are called, invited to join this blog. I don't have experience that can help you in your academic journey. The only experience that I know that works is obedience to scriptural instructions. It works for me, it will work for you as well. 'Light' is light. It doesn't matter where you got it from. PS.36:9. God is God, he change not. God is the same yesterday, today and tomorrow. He basically operates on commandments and rewards attached to them. Deu.28:1-3. When you dive into the commandments, He releases the rewards. Very simple!